In a dramatic turn from other books on the subject, Career Mechanics I, by Founder and President of MORRIS • ASSOCIATES INC. Thomas W. Morris III, looks at key employment issues from both sides of the table. The book addresses four audiences with overlapping interests: job seekers and career changers, employed workers, hiring managers and career coaches. Career Mechanics I focuses on career development, recruitment and retention, changing jobs, career assessment, resumes, networking, interviewing and negotiation. Informative and very useful… a reference that everyone in the American workforce should read. Morris’ years of helping people move toward satisfying, inspiring careers translates perfectly in this book. Now everyone can benefit from his smart, encouraging, expert advice. Career Mechanics I is an excellent resource for employees, employers, human resource personnel and those looking to make a career change. Tom Morris has distilled a wide range of usable information in a concise style that makes it easy to use as a reference tool. Tom Morris presents “Good News for Gray Hairs” at the National Speakers Association, Washington, DC Chapter, April 14, 2007. Click the links below to catch up on any editions of our insightful newsletter you may have missed. Topics covered include outplacement, coaching, training and retreat facilitation. 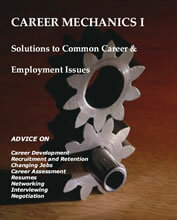 Or, subscribe to our CAREER MECHANICS newsletter today.